Ginni Natural Cotton Wadding or Batting is very popular in Home Furnishing Industry and baby care products. 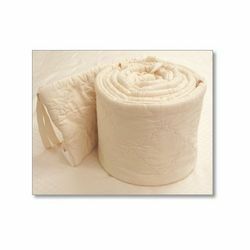 We are offering Chemical - Bonded Bleached Cotton Wadding or Batting. We offer Polyester Wadding. The products are created from natural fibers. These are known for their durability and reliable performance. 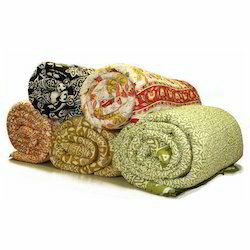 The fabric is used in various application areas. We offer 30-1100 GSM range. In our wide range of products, we are manufacturing and supplying Wadding/ Polyester Wadding. The gauze swab are folded all by machine. Pure 100% cotton yarn ensure the product soft and adherent. Superior absorbency makes the pads perfect for absorbing blood any exudates. In accordance with the customers Requirements, we can produce different kinds of pads, The adherent pads are perfect for operation. We are engaged in manufacturing of cotton rolls. In order to achieve maximum client satisfaction we always deliver our products within the specified time frame and that too at most competitive prices. Owing to its superior quality, our range of products is in a great demand not only in the domestic market but international markets too. Bleached Cotton Wadding Ginni Bleached Cotton Wadding or Batting is very popular in Home Furnishing Industry and baby care products. We are offering Chemical - Bonded Bleached Cotton Wadding / Batting.